Stayed there last weekend and really loved it. The reception staff (Maddie and Jamie) were super friendly and helpful. The rooftop is probably my favourite place (took great videos of sunrise over Bondi Beach and beautiful colours with sunset). Was lucky to join the FREE pancakes on the Sunday. Overall excellent stay! I booked for 2 nights but extended my stay to 4 , loved it! 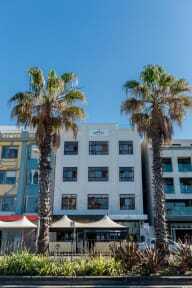 Had a lovely stay at Bondi Backpackers! Great room with very comfortable bed. Lovely helpful staff. Nice view from the reception. Bondi beach is a 2 minute walk, great location! Discount by a lot of bars and shops nearby. Free surfboard hire and movies. Definitely coming back here! Top located hostel, a lot of free facilities which was really good. The vibe in the hostel was only not so good, hard to meet new people, but still liked my stay in this hostel! Heerlijk hostel! Top plek aan het strand en vanaf hier ben je zo bij Bondi Junction en vanaf daar in de stad. De straat zit vol met bars, koffietenten en restaurantjes. Wil je even chillen? Dan kan dat op het dakterras. Daarnaast zijn er sport en yoga lessen. Kamers zijn groot en heerlijk bed! Echt aanrader en waar voor het geld!